Back when Nintendo was just pushing the 3DS onto an unsuspecting world, there was a lot of talk about where the Zelda franchise was going. Skyward Sword had been in the works for a long time, and now Ocarina of Time was getting a pretty major facelift in the form of Ocarina of Time 3D. So naturally people started to wonder, if Ocarina of Time was getting remade, what was next? Many people have rallied long and hard for Majora's Mask, though unfortunately that has not yet come to fruition. However, it didn't take long before Shigeru Miyamoto himself piped up saying he would love to remake A Link to the Past. It wasn't that long ago that I talked a bit about the importance of good controls. They matter a lot. You can tell a game is going to be fun if you pick it up and just controlling your character feels good even without goals or challenges to overcome. A Link Between Worlds has this feel. From minute one you can tell just how responsive Link is to your slightest nudge on the circle pad. He rockets around Hyrule at what seems like a blistering pace, and yet it never feels like he is out of control. He goes where you want, when you want. It seems simple, but it goes a long way when you can't blame stupid deaths on bad controls. Of course a lot of this precision comes from the simple fact that the 3DS uses the circle pad to control Link's movement. If you think about it, just about every 2D Zelda game has always used the d-pad for character movement. This of course comes with the inherent disadvantage of only being able to handle 8 different directional inputs. So it's not really a big surprise that given the 360 degree movement of the circle pad, A Link Between Worlds feels like a breath of fresh air. Granted there was Four Swords Adventures on the GameCube, and it's controls never really felt quite so awe-inspiring. But we won't talk about that. One of the things that A Link Between Worlds does best is making little changes that challenge the Zelda norm. Zelda has been around forever, and there are so many mechanics that have just existed from game to game, virtually unchanged in 20+ years. One of the biggest, but subtlest things A Link Between Worlds changes is the way it handles items, and more to the point, ammunition. You don't have to collect bombs or arrows or magic. Every item in the game uses the same resource; a "magic" meter which regenerates at a pretty rapid pace. This actually has a pretty profound effect on gameplay. At first I was a little dubious, because it means for example, I can only shoot x arrows in y period of time. But gradually I realized that because this meter always refills itself, I had so much more freedom to use items. 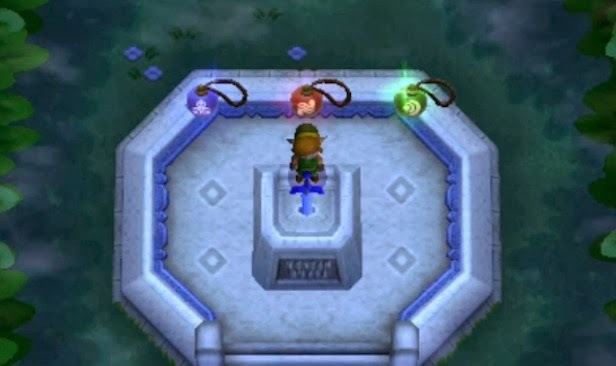 There is no saving your magic so you can use the Fire Rod to solve puzzles, or holding on to arrows to use them on the boss. You can throw bombs at random enemies all day and it's all good. It makes combat seem a lot more free to be done how you see fit, rather than relying on your sword to do everything. It cleans up the UI nicely, too. It's interesting, because I noticed a similar effect with the more freeform magic system in the Adventure of Link, but for the past 25 years the series has steered away from that. 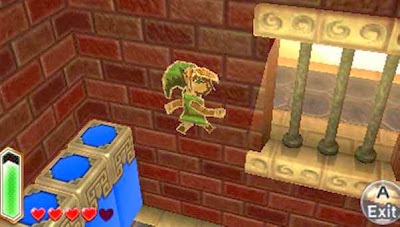 Link Between Worlds occupies this intriguing space wherein it's a game which is fully rendered in 3D, but it plays like a 2D game, but requires you to think in three dimensions. It's kind of amazing really, that with 3D games having existed for over 15 years, it's a game masquerading as 2D which nails the third dimensional game play better than most "proper" 3D games. Never does a puzzle say " look up, there's a switch on the ceiling you can't see, LOL 3D". Instead it just takes advantage of the fact that in 3D you can so easily render multiple elevations, change perspectives, transition to the backside of a wall, whatever. The top down view means you can always see exactly what the designers want you to be able to see, but it's still a world where you can merge with and walk around on the walls and smoothly transition between different elevations. 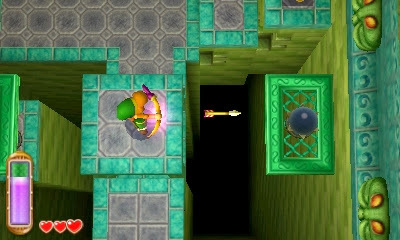 I mean sure, we've been pushing blocks onto lower floors for a long time now, but A Link Between Worlds forces you to look at every room in an entirely different way. Every wall has the potential to be a road. The only other game I can think of that has a similar feel to it is Portal. And I think we all know that comparing anything to Portal is pretty glowing praise. Let's be real here for a second. I was always going to love a Link Between Worlds. My body is physically unable to dislike a sequel to A Link to the Past just because of my history with the game. So as you can probably imagine, a Link Between Worlds is nostalgia overload for me. The sounds enemies make when you die or when you pick up rupees made me happy. The orchestrated songs from Link to the Past delighted me. The almost identical overworld map gave me all the feels. How many times have I made the journey between Kakariko Village and the Eastern Palace? This time felt little different from when I was 6. 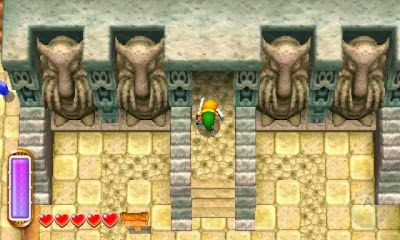 It feels like every nook and cranny of A Link Between Worlds was constructed with a nod to fans of A Link to the Past. 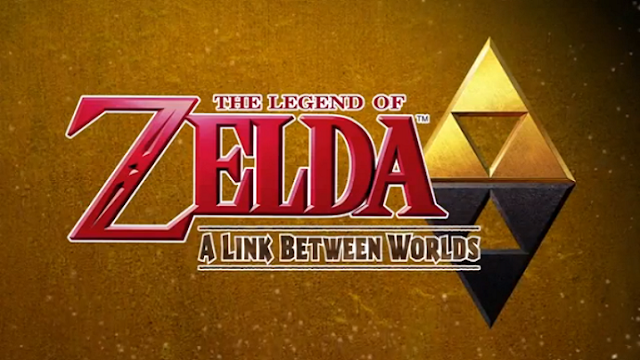 What's more impressive though, is that underneath all the similarities, A Link Between Worlds is it's own game. Every iota of this game perfectly maintains the feel of it's predecessor, but it's a brand new experience. The motto of this game may as well be "the same, but different" because it's stamped all over the place. Despite the similarities it still delivers on substance for returning players, and it's still hugely enjoyable for those who are not. The game is great with or without the nostalgia factor, and the fact that Nintendo has managed to strike such a great balance is pretty impressive. Although with that said, I'll never forgive them for changing the way the tempered sword sounds.